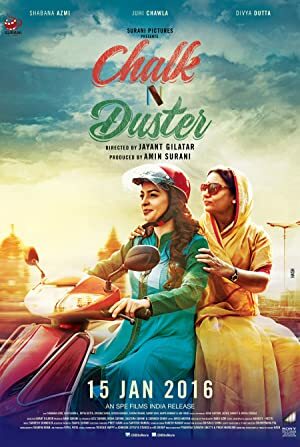 Description : CHALK N DUSTER is an emotional journey of two teachers Vidya ( Shabana Azmi) & Jyoti ( Juhi Chawla) , serving at a Mumbai - based High School. Their passion and love for teaching, bonds them in a special relationship with their students. Their gratification is good grades, moral values they strive to impart to students.However, in an evil turn of events, a wicked lady, Kamini Gupta ( Divya Dutta) gets appointed as the School Principal, who earlier worked in the capacity of a Supervisor. She is extremely cunning by nature and monopolizes on every opportunity she can find her hands on. In a bid to make profits for the school, she decides to fire experienced teachers to replace them with fresher teachers. The saved funds of which she can boastfully present to the school trustees, at the cost of quality education. Vidya suffers a sudden heart attack due to her dismissal from school. The school management threatens the staff to cut ties with Vidya. At such a time, Jyoti stands up for her friend and colleague, Vidya. Together they fight to earn their respect and credibility as teachers and unite against prejudices set by the management.